Rookie Highlights: Michael Manteit Watch the junior highlights of Michael Manteit, an 18-year-old defender from the Sandringham Dragons. With selection No. 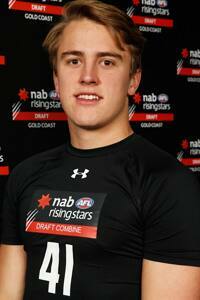 8 in the Rookie Draft, Collingwood has welcomed Michael Manteit, a defender from the Sandringham U18. Profile: Manteit has forged his early reputation by doing the little things coaches love. While the medium-sized defender reads the ball well and can drop off his man to influence contests, his desire to do the team things - chasing, tackling and spoiling - make him a favourite of teammates and the coaching staff. Has played predominantly at half-back where he can use his good kicking skills to set-up attacking forays from defence. Derek Hine Says: Michael’s a player who has played mostly at half back and through the midfield as well. He’s a nice user of the ball, he’s had a really consistent TAC Cup season. He was one of the last players left on our list post the National Draft, so we were really pleased to be able to bring him in. I suppose there’s the added bonus that he has a bit of a relationship with Brayden Maynard, coming from the same club. He’ll be in this afternoon and he’ll get into work ASAP. "Michael is a super hard and competitive kid. He really took a step up and held our backline together for us this season and was very unlucky not to go through the whole national carnival thos year. He injured a finger early in the year and played on with it despite having to wear a glove but he's almost a ready-made mature player now," – Sandringham Dragons talent manager Ryan O'Connor, Inside Football, November 2014.